Students wore their best onesies and pyjamas to attend the charity evening hosted by the EPR Department and the Year 10 JAC Team (Justice, Awareness, Charity). 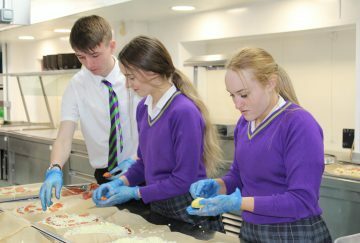 Pizzas were prepared by the Year 10 students, carefully selecting a variety of appetising toppings and served with some delicious fries. Our Catering Manager, Mr Pate, and some of his catering staff were on hand to ably assist with preparation! As our guests arrived into the Croston Theatre they were welcomed like celebrities with cheers and loud music. They quickly took to their seats to wait patiently for the film to start. This evening’s film was ‘The Bridge to Terrabrithia’ which captured the imagination and sense of adventure in many of our students. During the interval, the JAC Team set up colourful stalls selling an array of sweet treats – popcorn, chocolate fountain and cakes! Some brought a splash of colour by having their faces painted. After seeing the second half of the movie, the evening ended with a lovely disco with students really able to let their hair down after a busy term. This amazing evening was put together by the JAC Team to help raise awareness of their chosen charity – Rainbow House and Rory’s Rec Fund, the charities from the Year 7 EPR presentations. A fantastic £692.30 was raised for these two well deserving charities! Both Westholme School and Thomas Franks were delighted to actively support the charities by providing the food without any charge. The EPR Department would like to say a big thank you to all those involved in making the evening a great success.